You Make Me Sooooo Happy! Ok, enough rhyming. But seriously. I love these. Just TWO tablespoons provides me with 11 grams of protein and 2 grams of Omega 6/3’s. They are soft and tasty…and I put them in EVERYTHING. Lately, my favorite thing to do is slice up some bananas, rolls them in hemp seeds, drizzle with agave, and eat! Yum. I also love to put them in my smoothies for an added protein boost. They are also deliciously nutty in salads…along with my ground flax seeds, raw walnuts, and raw sunflower seeds. You can also use them in baked goods…Dreena Burton uses them quite a bit in her cookbooks. The uses are endless…and that’s not even including hemp nut butter, hemp seed oil, hemp protein! 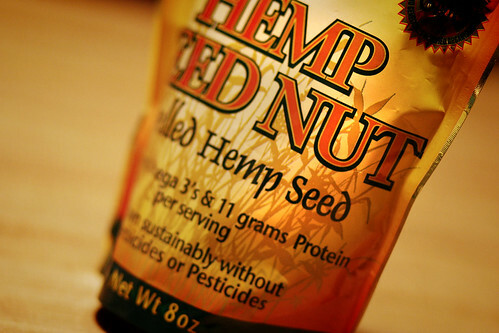 For those of you that are concerned…NO, you cannot get high by eating hemp seeds. 😉 For more detailed info, check out Living Harvest’s website. Nutiva is a great brand, as well as Manitoba Harvest (see comments for 20% discount code for Happy Foody readers!) and Living Harvest (I especially like Living Harvest’s hemp milk). Hi! I have found your blog so inspiring! It’s a great source of information and I’d like you to know I’ve tried several of the recipes and loved them all. I live in a rural part of the midwest and don’t come across too many people who are looking to improve their diet and the world. Thank you. How pleasantly surprised was I to see this morning? How wonderful it is to have appreciation being spread about our nutritious little seeds. I would like to offer a gift. Everyone who reads this gets a part. How can we make it easier for you to try our shelled hemp seed, hemp seed butter, hemp seed oil, hemp protein and hemp protein & fibre powder?!?! To offer you discounts! Use the promo code ‘happyfoody’ upon check out and receive 20% off your entire order. This cannot be used with any other promo or by wholesale accounts. Autumn…thanks so much for offering the discount!! That’s awesome. Thank you for the coupon code, I am going to have to try the seeds! I wish I would have known about this store when my sister lived in Winnipeg! Cool! I have been wanting to try hemp products, but can’t seem to find them around here. I ordered a couple things from Manitoba Harvest thanks to the discount. I got the oil and the seeds. Thanks Sara for the info and thanks Autumn for the discount! Banana, hemp seeds and agave… thanks for the idea. I saw these at the grocery today & just had to get some! They ARE yummy – thanks! I’m gonna try that pineapple cashew thing, too, (if I can get it made before Patrick eats all the pineapple) along with some recipes from Vegan Lunch Box. I love hemp seeds and Living Harvest hemp milk is great…we do vanilla hemp milk with Nutiva chocolate hemp shake (http://nutivahempshake.com/choc.htm) for hot cocoa around here. The kids love it! Yum! Manitoba Harvest stuff is great! I use their Hemp Protein powder with Fiber combined with ground-up flax seeds all the time in my green smoothies, which I have reinstated in my diet. I love them in my breakfast bowl which is fresh blueberries with strawberries or diced granny smith apple. Sprinkle hemp nuts all over and sometimes add soaked and peeled raw almonds too. Then add some milk. Yummy! I don’t even need to add oats or grape nuts any more. Hemp nuts replaced my cereal, and I love the taste and texture better than flaxseeds. lpek…GREAT idea! Love this. I will often make “apple cereal” with tiny bits of apple, cinnamon, agave, and almond milk. Hemp seeds would top it off perfectly. Hello males you know marijuana has become legalized pertaining to discretion makes use of within just Uruguay along with several claims inside of United states, whats your opinion over it? you imagine that legalisation including bud is great or possibly negative?